Home Child Health & Disorders Child Dental Health Is Important From Early Age! Child Dental Health Is Important From Early Age! Child dental health should begin before your child’s first tooth comes in. Children can get easily irritated with routines. Always they are told what they should do and it is easy to become insensitive to orders. Therefore it becomes difficult to get your child in good child dental health. Children will not be eager to do something that takes a certain amount of their time everyday. So, it is important to establish child dental health as soon as you can. 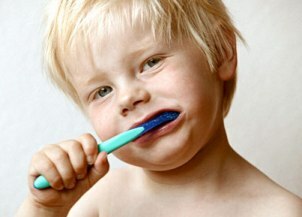 You should make your child to learn brushing his teeth when he is around age three. You should help him how to brush the child so that he can get used to the process. If you are teaching your child dental health well, you can expect that your child can maintain hygiene without irritating you at the age of eight. When your child is learning the proper way to brush, you can brush your teeth along with him. Show your child slowly each and every step. The steps include rinsing the toothbrush, applying toothpaste, brushing for right amount of time, spitting and rinsing. If you brush along with your child, you can help him to establish the proper lengths of time that are required to brush the teeth. Show your child that you are brushing your teeth at the same point every day. You have to see whether your child is brushing for proper length of time. Purchase an egg timer to use in bathroom so that your child will take the time to clean each and every tooth effectively. The key to child dental health is making brushing a fun. Make it seem that brushing is fun rather than a chore. You can teach your child to hum a song while brushing. Use only a pea-size amount of toothpaste as large amounts can create excessive foam making it difficult for your child to brush. When teaching child dental health, make sure that your child spits out the toothpaste. Swallowing toothpaste on consistent basis can lead to fluorosis. If you create a routine, children respond well and follow that routine. You can place a board in the bathroom which contains a check list of brush times for your child. Give colorful stickers to put on the board when they have brushed their teeth and they will be eager to ensure that the board stays full. These are few steps to help your child establish regular brushing habits. As a parent, you should concentrate on child dental health and make sure your child learns good dental habits. They can perform and continue these habits for the rest of their lives. Previous articleParenting Books Offers Information For Different Things That Come In Part Of Your Life! Next articleChild Disciplining? How Far Can Parents Go?